If business limited features are negatively affecting your ability to communicate and succeed then the features of GiNiEX's connect service maybe what you've been looking for! Chat with colleagues quickly and efficiently with our instant messaging service. 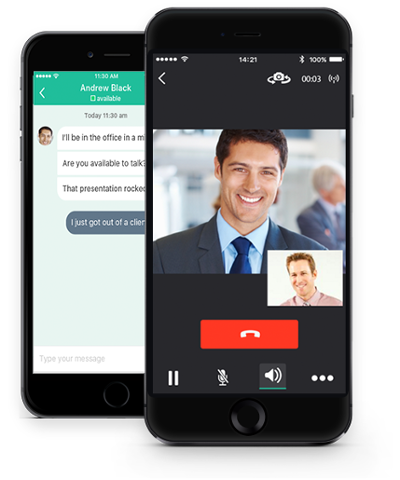 Call your colleagues from your own phone using cellular network or VoIP with audio or HD video. Jump into virtual meeting rooms from anywhere, anytime. Transfer calls to your phone to keep your conversations moving. Keep you business contacts in one core directory. Never miss a call again with Connect's call tracking log. With Connect, you only need one phone for business and personal use. It uses your business number when you’re calling a customer, so you maintain a professional image while keeping your mobile number private. Plus you benefit from rich business features - so you can stay productive while on the go. Improve GiNiEX Connect further by integrating it with powerful apps that can improve productivity even further. The Communicator allows you to send instant messages and emails to anyone within your contacts quickly and easily.